MELBOURNE, AUSTRALIA--(Marketwire - September 24, 2010) - Melbourne is a city of neighborhoods. Italian or Chinese, groovy or chic, bohemian or beachside -- Melbourne has them all. The Melbourne Central Business District features a modern skyline set against well-preserved Victorian architecture, and is home to luxury boutiques and prestigious offices and hotels, including the five-star Melbourne Marriott Hotel. It is the perfect starting point for a Melbourne getaway. The Melbourne hotel offers a variety of exciting accommodation packages, including the Escape Relaxation Package, the Melbourne Aquarium Package and the Escape Shopping Package, as well as special deals for Marriott Rewards Members. These offers are perfect for guests looking for accommodation deals in Melbourne. The Melbourne Marriott Hotel is also excited to offer guests a great way to enjoy "Stay for Breakfast" rates from now until January 15, 2011. Starting at just $279 AUD per night, the hotel package is valid for guests who book a two-night stay Friday through Sunday through 1/15/11*, and includes a full breakfast buffet. Onsite car parking is also included in the package. Reservations may be made online using promotional code S4B or call 1-800-228-9290 in the US and ask for promotional code S4B. The five-star Melbourne Marriott Hotel is unique among luxury hotels in Melbourne and is conveniently located in the heart of the city. It features outstanding facilities and service that are unmatched amongst other Melbourne, Australia hotels. Petite in size yet grand in style, the Melbourne Marriott offers a charming setting for a family vacation or weekend escape. The winner of the 2009 Victorian Tourism Award for Luxury Accommodation, the Melbourne Marriott Hotel conveniently places guests mere steps from the shopping delights of Bourke and Collins Streets, the cultural and culinary delights of Chinatown, and is conveniently close to the historic Melbourne Museum and Royal Exhibition Building. Guests will also enjoy the indoor heated pool, complimentary in-room coffee and tea, an expert concierge to help coordinate activities and events, plus a full array of additional services, from limousine to valet dry-cleaning, unmatched at any other boutique hotels in Melbourne. * Valid Friday through Sunday through 1/15/11. This offer is not valid during special events. Limited number of rooms are available for this promotion. Tax is additional. Offer does not apply to groups of 10 or more rooms. Offer cannot be combined with any other promotions. Blackout dates may apply. Advance reservations required. Other restrictions apply. Rates are per room, per night and based on availability at the time of reservations. 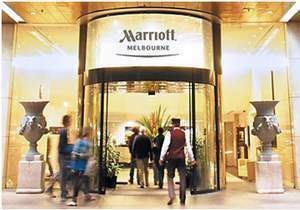 The Melbourne Marriott Hotel has been recognized as a "green" luxury hotel, and is located in the heart of Melbourne. A stand-out among Melbourne hotels, this charming property offers 166 rooms and 19 suites on 10 floors, and also features 4,650 sq ft of total meeting and event space, concierge, an on-site fitness center featuring cardio and weight equipment, an indoor pool, as well as a full-service business center. The Melbourne Marriott Hotel, your 'Home in Melbourne' is a stylish boutique hotel located in the heart of the Melbourne CBD. Situated at the Paris end of the city, and amongst the theatre and elite shopping district, there is never a shortage of things to do.